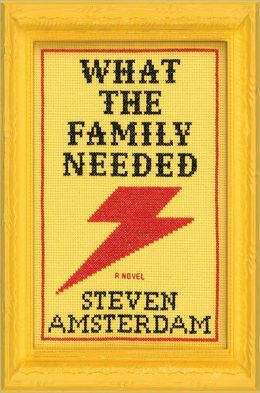 Steven Amsterdam’s What The Family Needed offers perspective on how people cope with drama in their lives. In a series of stories that span three decades, each focused on a member of two related families, Amsterdam gives some fantastic help – each person develops the superpower needed at the time: invisibility for the teenager coping with being uprooted by her parents’ divorce, the ability to hear mute patients’ thoughts for the hospice nurse, the at-home father who can fly away, and more. Although Amsterdam plays it straight – he actually has each character practice his or her new skill – the underlying possibilities for everyman are clear. Who wouldn’t want to fly away or be invisible now and then? Alek, the troubled youngest child, wanders through the action of the others, teasing the reader with the possibility of his superpower, which is revealed in the last chapter -leaving the reader wondering if any of it actually occurred. Strange but thoughtful read – not for everyone – but Amsterdam kept my attention throughout and piqued my curiosity. What superpower would help you get through the day? This entry was posted in authors, book review, books, fantasy, reading and tagged Alek, Amsterdam, family, Family Needed, family relationships, Steven Amsterdam, superpowers, What the Family Needed. Bookmark the permalink. Well you’ve piqued my curiousity so this one is going on the book list. As to my superpower …. at work we have assigned superpowers, based on our work habits. Mine apparently is the ability to remain neutral. What I’d like? Endless energy! Let me know what you think of the family after you read it. As for the endless energy, I could use that too. But I would swap for being able to travel in an instant – beam me up, Scottie. I don’t know this writer…I’ve always liked series of stories that for a whole. At the moment am deep into my fourth Jane Gardamt, The Queen of the Tambourine. Read and reviewed that book but cannot remember now what it was about ( happens to me a lot) – but Jane Gardam is one of my all-time favorites. Been trying to comment on your posts but having trouble sending – will keep trying. Thanks for stopping by. Thanks for the poem; I can relate – and daily am grateful that I can always look it up on google.